^ 1.0 1.1 （英文）Holtz, Thomas R. Jr. (2011) Dinosaurs: The Most Complete, Up-to-Date Encyclopedia for Dinosaur Lovers of All Ages, Winter 2010 Appendix. ^ （英文）Dodson, P. 1996. The Horned Dinosaurs. Princeton: Princeton University Press. 346pp. ^ 3.0 3.1 3.2 3.3 3.4 （英文）You H. & Dodson, P. 2004. 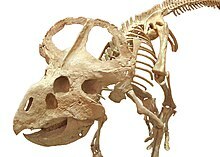 Basal Ceratopsia. In: Weishampel, D.B., Dodson, P., & Osmolska, H. (Eds.). The Dinosauria (2nd Edition). Berkeley: University of California Press. Pp. 478-493. ^ 4.0 4.1 4.2 （英文）Dodson, P., Forster, C.A., & Sampson, S.D. 2004. 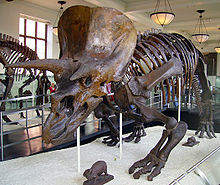 Ceratopsidae. In: Dodson, P., Weishampel, D.B., & Osmolska, H. (Eds.). The Dinosauria (2nd Edition). Berkeley: University of California Press. Pp. 494-513. ^ （英文）Marsh, O.C. (1890). "Additional characters of the Ceratopsidae, with notice of new Cretaceous dinosaurs." American Journal of Science, 39: 418-429. ^ （德文）Steel, R. 1969. Ornithischia. In: Kuhn, O. (Ed.). Handbuch de Paleoherpetologie (Part 15). Stuttgart: Gustav Fischer Verlag. 87pp. ^ （英文）Benton, M.J. (2004). 'Vertebrate Palaeontology, Third Edition. Blackwell Publishing, 472 pp. ^ Liyong, Jin; Zan, Shuqin; Godefroit, Pascal; 等. A New Basal Neoceratopsian Dinosaur from the Middle Cretaceous of Jilin Province, China. Acta Geologica Sinica. 2009, 83 (2): 200. doi:10.1111/j.1755-6724.2009.00023.x. ^ Lee, Yuong-Nam; Ryan, Michael J.; Kobayashi, Yoshitsugo. The first ceratopsian dinosaur from South Korea (pdf). Naturwissenschaften. 2010, 98 (1): 39–49. PMID 21085924. doi:10.1007/s00114-010-0739-y. ^ （英文）Rich, T.H. & Vickers-Rich, P. 2003. Protoceratopsian? ulnae from the Early Cretaceous of Australia. Records of the Queen Victoria Museum. No. 113. ^ （英文）Sereno, P.C. 1998. A rationale for phylogenetic definitions, with applications to the higher-level taxonomy of Dinosauria. Neues Jahrbuch fur Geologie und Palaontologie: Abhandlungen 210: 41-83. ^ （英文）Xu X., Makovicky, P.J., Wang X., Norell, M.A., You H. 2002. A ceratopsian dinosaur from China and the early evolution of Ceratopsia. Nature 416: 314-317. ^ （英文）Makovicky, P.J. 2001. A Montanoceratops cerorhynchus (Dinosauria: Ceratopsia) braincase from the Horseshoe Canyon Formation of Alberta, In: Tanke, D.H. & Carpenter, K. (Eds.). Mesozoic Vertebrate Life. Bloomington: Indiana University Press. Pp. 243-262. ^ 19.0 19.1 （英文）Chinnery, B. 2005. Description of Prenoceratops pieganensis gen. et sp. nov. (Dinosauria: Neoceratopsia) from the Two Medicine Formation of Montana. Journal of Vertebrate Paleontology 24(3): 572–590. ^ （英文）Makovicky, P.J. & Norell, M.A. 2006. Yamaceratops dorngobiensis, a new primitive ceratopsian (Dinosauria: Ornithischia) from the Cretaceous of Mongolia. American Museum Novitates 3530: 1-42. ^ （英文）You H. & Dodson, P. 2003. Redescription of neoceratopsian dinosaur Archaeoceratops and early evolution of Neoceratopsia. Acta Palaeontologica Polonica 48(2): 261–272. ^ （英文）You H., Li D., Lamanna, M.C., & Dodson, P. 2005. On a new genus of basal neoceratopsian dinosaur from the Early Cretaceous of Gansu Province, China. Acta Geologica Sinica (English edition) 79(5): 593-597. ^ （英文）You H. & Dong Z. 2003. A new protoceratopsid (Dinosauria: Neoceratopsia) from the Late Cretaceous of Inner Mongolia, China. Acta Geologica Sinica (English edition). 77(3): 299-303. ^ （英文）Chinnery, B.J., Lipka, T.R., Kirkland, J.I., Parrish, J.M., & Brett-Surman, M.K. 1998. Neoceratopsian teeth from the Lower to Middle Cretaceous of North America. In: Lucas, S.G., Kirkland, J.I., & Estep, J.W. (Eds.). Lower and Middle Cretaceous Terrestrial Ecosystems. New Mexico Museum of Natural History and Science Bulletin 14: 297-302. ^ （英文）Sues, H.-D., and Averianov, A. (2009). "Turanoceratops tardabilis—the first ceratopsid dinosaur from Asia." Naturwissenschaften, doi:10.1007/s00114-009-0518-9. ^ （英文）Erickson, G.M. & Tumanova, T.A. 2000. Growth curve of Psittacosaurus mongoliensis Osborn (Ceratopsia: Psittacosauridae) inferred from long bone histology. Zoological Journal of the Linnean Society of London 130: 551-566. ^ （英文）Dodson, P. 1976. Quantitative aspects of relative growth and sexual dimorphism in Protoceratops. Journal of Paleontology 50: 929-940. ^ （英文）Lehman, T.M. 1990. The ceratopsian subfamily Chasmosaurinae: sexual dimorphism and systematics. In: Carpenter, K. & Currie, P.J. (Eds.). 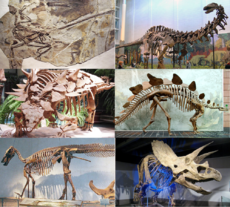 Dinosaur Systematics: Approaches and Perspectives. Cambridge: Cambridge University Press. Pp. 211-230. ^ （英文）Naish, D. (1999). EVIL FANGED CERAPODANS Archives of the Dinosaur Mailing List, April 23, 2011. ^ （英文）Witton, M. (2007). Ha Ha! Charade You Are Mark Witton's Flickr, April 23, 2011. ^ （英文） Paul, G.S., and Christiansen, P. Forelimb posture in neoceratopsian dinosaurs: implications for gait and locomotion. Paleobiology. September 2000, 26 (3). ^ （英文）Longrich, N. (2010). "The Function of Large Eyes in Protoceratops: A Nocturnal Ceratopsian? ", In: Michael J. Ryan, Brenda J. Chinnery-Allgeier, and David A. Eberth (eds), New Perspectives on Horned Dinosaurs: The Royal Tyrrell Museum Ceratopsian Symposium, Indiana University Press, 656 pp. ISBN 0-253-35358-0. ^ （英文） Schmitz, L. and Motani, R. Nocturnality in Dinosaurs Inferred from Scleral Ring and Orbit Morphology. Science. 2011, 332 (6030): 705–8. PMID 21493820. doi:10.1126/science.1200043. ^ （英文）Rothschild, B., Tanke, D. H., and Ford, T. L., 2001, Theropod stress fractures and tendon avulsions as a clue to activity: In: Mesozoic Vertebrate Life, edited by Tanke, D. H., and Carpenter, K., Indiana University Press, p. 331-336. ^ （英文）McWhinney, L., Carpenter, K., and Rothschild, B., 2001, Dinosaurian humeral periostitis: a case of a juxtacortical lesion in the fossil record: In: Mesozoic Vertebrate Life, edited by Tanke, D. H., and Carpenter, K., Indiana University Press, pp. 364-377.